Rites of Battle: Podcast #13 - 7th, Orks, and so much More! 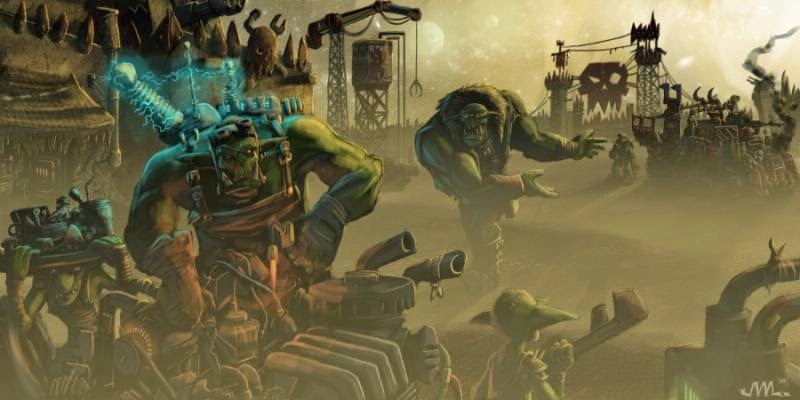 Podcast #13 - 7th, Orks, and so much More! Salutations from the Rites Staff and guest caster Havoc! With the first month of 7th under our feet and the first codex in hand, we're finally ready to sit down and take a long hard look at things. Join us, and don't forget to hit us up in the comments about what you thought! I'm all in favor of more games on the site. If I believed half the stuff Corvus says it sounds like 40k is gonna be further in the toilet sooner than later. On a more positive note, X-wing sounds fascinating, will have to investigate that. I don't think there was anywhere near close to the title-implied time spent on Orks, but I'll chalk it up to you guys not bein' proppa. One thing I'm sad went away in the new codex: Old Zogwort, special character weirdboy and frier of special characters. The whole reason I made Disco Grot was to boogie space-marine special snowflakes so hard they turn into squigs. He got repurposed as an SAG once it was made clear to me it was empirically impossible to play him (not being allowed to use half your powers because BS 0 will do that), but the fact remains I wanted them to fix him, not squat him. Also Godfrey, I'll trade you a scratchbuilt ork army for an empire army. I don't think we'll see GW go under, not for some time. They're still posting a profit, and certainly have a significant portion of customers who disregard/disagree with what I say, either because they're hobbyists, having a better game experience than I am, or because they're just here to game a "broken" system. Find a friend. Buy the starter box. Do it! Our Ork-y discussion was a touch short lived, but that was largely due to our player most interested in them being slightly unfamiliar with the codex in some regards. Likewise, Godfrey is in a similar boat as you with his beloved culti-... er... Penal Legion (and Colossus) with those selections having been "scrubbed" from the Guard codex. If you're looking for the Empire army, I'd love to get rid of them. Let me know if you wanna buy em, because I'm willing to go pretty cheap just to get rid of the darned things. I might be able to get a list of models up... but I honestly have little to no clue what many or even most of them are. And they aren't really painted to speak of. A few here and there probably. Eh, I'm kinda strapped for cash atm, so between not having much disposable income (when I say scratchbuild I'm talking household items), and losing faith in geedubs to make enjoyable games, I'd pretty much just be looking at it on a "If you're just gonna give it away, otherwise keep for someone who wants it more" type basis. Havoc and I just played a little of WM/H, and evidently HEretic has gotten in some. I gotta say, underwhelmed. Quick initial brush is a rule set which is arguably more highly abstracted than 40k's, and has "little" interaction outside of a few units which can activate out of sequence, otherwise your units are "dumb" during enemy turns. And for a system that so heavily relies on its rules (because they /cannot/ rely on their models), I didn't necessarily find them any better than 40k's. Sure, they may have gotten the value of "a single list building point" better, but there's significant weaknesses to core dynamic interactions between WM and H, leaving them feel a bit like a cluster cuss. In the end, it feels a lot like chess, which I really don't like. 40k may be "failing" a bit in my opinion to emulate Go, but there seem to be far more interesting choices there than with WM/H when it comes to combat. Sure, it's from 3++ (which is a bit WAAC for our tastes around these parts) but they're usually much more forgiving to WM/H and very scathing to 40k. In all fairness, the grand majority of 40k units are "dumb" outside your turn unless they're actively punching face, wildly waving their guns in the teeth of an immanent face-punch, or paid points to have a single round of "not-dumb". Neither game is Infinity, and I'm not expecting them to be. Never having played that either, I'm not sure if that's a good thing or not. That article kinda makes me just want to pinch the bridge of my nose though. The presentation really makes it hard to get through to the heart of the matter. The age of the article also hurts it, as it's talking about the state of the game circa 2011, which in GW terms is roughly an edition, three tournament seasons and two rounds of codices out of date. While I could go through and itemize my own objections to the assertions therein, I'll hold off and go for a more generalist response. I think most of it comes down a difference in game preference. I *like* its similarities to chess, albeit with giant stompy robots instead of rooks and a wizard getting work done instead of a lazy king. Chess' tight strategic aspect appeals to me, although I can't really get over the progression curve of thinking in terms of 3/4/5 turns to endgame in advance. I compare it more to my perceptions of Fantasy than 40k, the two seeming a better parallel to me, as they're the ones jockeying for my "play the good guys for once" slot. By comparison, WM/H has a healthier-seeming high-tier "ceiling", with a lower entry price, growing rather than shrinking support group, a less blatantly profit-mongering company with better community relations, and a tighter-looking ruleset, with less net-list supremacy*, and more sophisticated tactics being easier to wrap my head around than with the square bases. *it's there, I know, but it seems more "we've made lean bacon, but fat bacon works too" rather than "THIS WINS AND NOTHING ELSE"
Models are largely irrelevant, as I plan to make/intensely modify my own rather than leave the boogers stock. Also the ability to have my giant robot/troll do armlocks, headbutts and judo throws just kinda appeals to my inner ork. In 40k my units can take saves. That means I'm rolling dice, and even if it's just an illusion of true interaction, it feels much better than what WM/H offers. In the game I played, my huge cannon scattered off (they always scatter, no matter your skill), landed on a single model (which I still had to roll to hit, WTF), and dealt a single wound to said model. A /cannon/ has "the same" wounding potential as a pistol if your dice crap out. No instant death. No concussive. And way too hard to hit with. Blast weapons are super punished in the system too as we see in that example. Add to that that you're allowed to fire "flamer" weapons /over your own troops/ and you've got a significant degree of abstraction which punishes shooting and lets a dude do the same damage in melee with a knife as a robot with a boxing glove. I may hate some parts of 40k right now, but there's a lot of "system level" things that I feel it does very well, especially in the wake of playing a 50 pt. skirmish. Tight rules locking out loop holes are great (2+ cover in area ruins, amIrightguys? ), they really are, but there comes a point where tight rules are constrictive and limit player ingenuity and developer freedoms, and having played 40k and looked heavily into Fantasy, I'm not sure I'm willing to give up the per model options that are present in those systems in order to get a "better" tournament-tier ceiling. PP is /not/ less evil than GW, or at the very least, their fanboys aren't every bit as bad. Likewise, there's less need to netlist in WM/H when themed lists hand it to you. Likewise, 40k isn't horribly unhealthy right now on the whole. Daemons are a tad weak (I believe anyway, maybe I'll be shown wrong) and Tyranids might be too (heavy reliance on Crones/Mawlocks for tank busting and early threat pressure), Eldar is still top dog (in my opinion), but Tau are just a little more powerful than everything else (even with Farsight doing wonders for them in Maelstrom). Everyone else is kind of hanging out in the same spot where power level is concerned in my opinion, save for older codices like DEldar and maybe sisters too. If you wanna play a big monster game with all those over the top WWE/Pacific Rim moments, track down a 2 player starter for Monsterpocalypse. Hands down the most fun I've ever had with a "basic" miniatures game, and certainly a contender for the most fun system I've ever played.